One thing I have learned about the presidency is that whatever shortcomings you have, people are going to notice them -- and whatever strengths you have, you're going to need them. There is only one force of history that can break the reign of hatred and resentment, and expose the pretensions of tyrants, and reward the hopes of the decent and tolerant, and that is the force of human freedom. The survival of liberty in our land increasingly depends on the success of liberty in other lands. When you stand for your liberty, we will stand with you. By our efforts, we have lit a fire as well--a fire in the minds of men. It warms those who feel its power, it burns those who fight its progress, and one day this untamed fire of freedom will reach the darkest corners of our world. Freedom is not America's gift to the world, it is the Almighty God's gift to every man and woman in this world. Freedom and fear, justice and cruelty, have always been at war, and we know that God is not neutral between them. The battle is now joined on many fronts. We will not waver; we will not tire; we will not falter; and we will not fail. They want the federal government controlling Social Security like it's some kind of federal program. I believe that God has planted in every human heart the desire to live in freedom. And even when that desire is crushed by tyranny for decades, it will rise again. America has never been an empire. We may be the only great power in history that had the chance, and refused - preferring greatness to power and justice to glory. God is not on the side of any nation, yet we know He is on the side of justice. Our finest moments [as a nation] have come when we faithfully served the cause of justice for our own citizens, and for the people of other lands. The desire for freedom resides in every human heart. And that desire cannot be contained forever by prison walls, or martial laws, or secret police. Over time, and across the Earth, freedom will find a way. America has never been united by blood or birth or soil. We are bound by ideals that move us beyond our backgrounds, lift us above our interests and teach us what it means to be citizens. The advance of liberty is the path to both a safer and better world. We have learned that terrorist attacks are not caused by the use of strength; they are invited by the perception of weakness. And the surest way to avoid attacks on our own people is to engage the enemy where he lives and plans. We are fighting that enemy in Iraq and Afghanistan today so that we do not meet him again on our own streets, in our own cities. 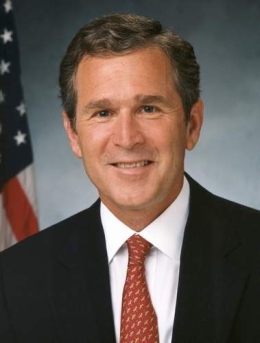 33 quotes by George W. Bush.